In the distant past, the head executioner Rafando (Ivanno Jeremiah) says to the Doctor (Peter Capaldi), “The destruction of a Time Lord is a particular honor.” His race, the Carnathon deal in death. Missy (Michelle Gomez) is the Time Lord receiving the honor. They needed another Time Lord to be present, hence the Doctor. They have a procedure, which will stop both hearts and end the regenerative process. They place the body in a Quantum Fold Chamber for 1,000 years to make sure the dead Time Lord does not regenerate. Returning to the present, the Doctor speaks to the vault, “They can’t know I’m blind Missy, my memories are much worse in the dark.” The Quantum Fold Chamber emerges from the lake. Missy begs for her life. 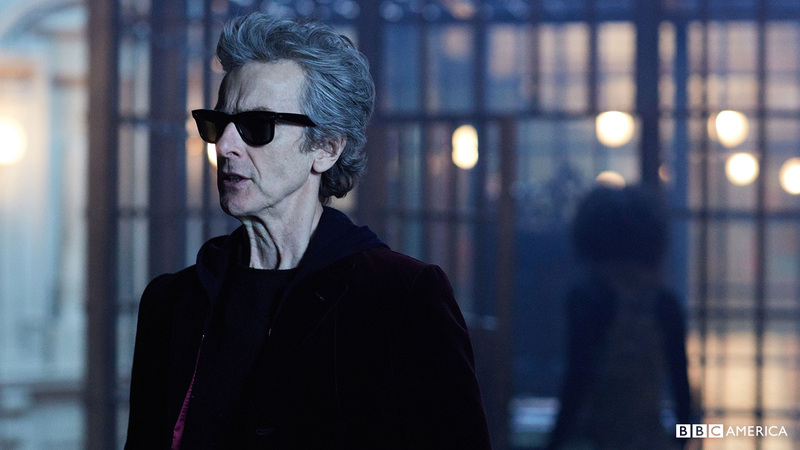 Back in the present, the Doctor receives an email through his shades; it says Extremis. The Doctor is in an empty lecture hall. Papal representatives enter the hall. His shades can only tell him if they are male or female and their height and weight. Nardole (Matt Lucas) enters to help fill in the details. Cardinal Angelo (Corrado Invernizzi) tells the Doctor Pope Benedict IX recommended him back in 1045. He smiles because Pope Benedict IX was a woman who knew how to use her castanets. The Pope (Joseph Long) enters the hall. They place a piece of a page in front of the Doctor; the title of the text is Veritas, ‘The Truth’. Originally written in a dead language; the people who translated it are dead; anyone who reads it dies, by their own hand. Bill (Pearl Mackie) enters her foster mom’s, Moira (Jennifer Hennessy) apartment with her date Penny (Ronke Adekoluejo). Moira thinks Bill is bringing a man to the house at this late hour, but is relieved it is only a woman. (She doesn’t know that Bill is a lesbian.) Bill and Penny can hear the TARDIS materializing in Bill’s bedroom. Penny is skittish, so Bill is trying to make her comfortable, but her efforts fail when some priests come out of her bedroom. When they go to investigate in Bill’s bedroom, Penny bolts when the Pope starts talking to them in Italian. Bill enters the TARDIS to tells the Doctor, “Doctor, here’s a tip. When I’m on a date, when that rare and special thing happens in my real life, do not; do not under any circumstances put the Pope in my bedroom!” The Doctor says it is noted and tells Nardole to explain to Bill what is going on. Cardinal Angelo mentions that Pope Benedict IX said the Doctor had much to confess. He can tell the Doctor has a major regret on his mind. We flash back to Missy’s execution. She is begging for her life, “I’ll be good. I promise. I’ll turn good, please. Teach me how to be good.” The Doctor asks her can she do it without hope, without witness, without reward. The priest in the cage was the only translator who had not committed suicide. He runs out of the cage with a gun in his hand. The Doctor sends Bill and Nardole after him. He wants to read the Veritas alone. He brought a machine from the TARDIS that will help him see temporarily (at a high price). Bill won’t follow Nardole’s instructions. He has to get serious with her and lay down the law, “I’m the only person you’ve ever met or will ever meet who is officially licensed to kick the Doctor’s arse. I will happily do the same to you in the event that you do not align yourself with any instructions that I have issued which I personally judge to be in the best interest of your safety and survival.” Bill is noticeably impressed, “Nardole! Are you secretly a badass?” He confidently replies, “Nothing secret about it…Baby Doll.” His toughness evaporates when he sees the dead priest on the floor. They see another bright light, it is a portal, and they walk towards it. We are back at the Haereticum. The Doctor uses the device and he can only see fuzzy images. Someone heads towards the Doctor; he thinks it is Cardinal Angelo. Bill and Nardole walk through the portal and find themselves in the Pentagon. They walk back through the portal and find themselves in a white chamber that has large objects with other portals that lead to other places, such as the Vatican, Pentagon and CERN. They go through the CERN portal. We return to the Doctor. His sight clears up enough to realize he isn’t talking to Cardinal Angelo but some aliens in red monk robes. They take the Veritas from the Doctor but he escapes and takes the translators laptop with the copy of the Veritas on it. Back at the CERN, the scientists are having a sad celebration. A clock is set for five minutes, one of the scientist tells his fellow scientist to drink. Nardole tells Bill to look under the tables. The tables have explosives under them. The Doctor opens the laptop, the document on it reads, Veritas: A Test of Shadows. His vision gets blurry again. The alien monks surround him; he sees a light and follows it. Bill asks the scientist why they are doing this. The head scientist (Francesco Martino) realizes they haven’t read it. He tells them this isn’t the real world; here is a test, when he hits the table, say any number in their heads. He hits the table and Bill and Nardole say the same number. Every time he hits the table, the both say the same number; soon the other scientist join them and they recite the same numbers. This is the test of shadows. Bill and Nardole run out of CERN just before it explodes. Nardole figures out the large objects are projectors and the projectors are projecting a simulation. He asks aloud if they are in it. 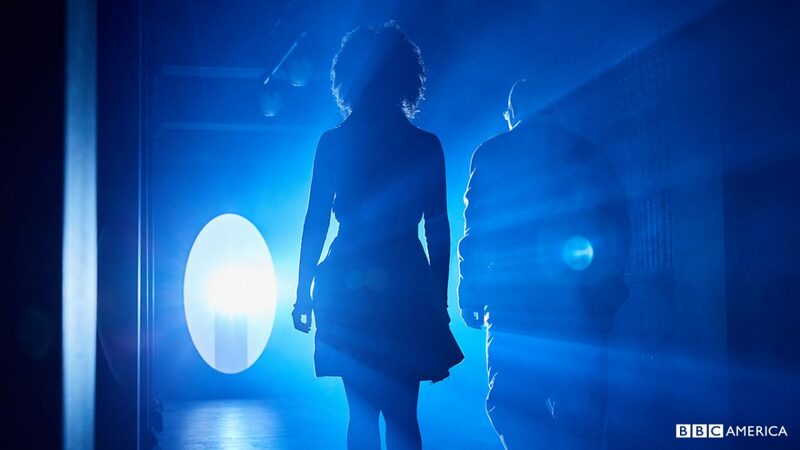 Nardole walks out of the light and his hand becomes a graphic as he disappears. Bill sees a blood trail and follows it through a portal that leads to the White House. The President committed suicide in the Oval Office and the Doctor is sitting at his desk. Bill: “I need to know what’s real and isn’t real.” Doctor: “The Veritas tells of an evil demon that wants to conquer the world. But to do it, he needs to learn about it, first. So he creates a shadow world. A world for him to practice conquering. Full of shadow people that think they are real.” Computers aren’t good at random numbers, people in the simulation will say the same numbers. Bill tells him she said the same numbers, the Doctor admits he did too. She starts crying and asks for the Doctor’s help; she slowing disappears. The alien monk was behind her. The Doctor knows he isn’t the real Doctor and he is ready to give up when he flashes back to Missy saying without hope, without witness, without reward. He remembers that virtue is only virtue in extremis. He informs the alien monk that their simulation was too good. Even though he isn’t the real Doctor, he has laid a trap for them. The shades he is wearing has recorded what has happened in the simulation. He will be able to email this information to the Doctor in the real world. We are back at the beginning of the episode. He received this email. The Doctor calls Bill who is writing an essay he assigned to her. He asks her if she knows a Penny; Bill does, she thinks she is out of her league. The Doctor assures her Penny is not out of her league, he instructs her to call Penny tonight. He thinks they are going to be very busy soon. We go back to Missy’s execution. A Carnathon guard nudges her body, Missy tells him she is trying to sleep. The Doctor didn’t execute her; he rewired the device so it would only give her a small jolt, enough to put her to sleep. He didn’t promise to kill her, only to watch her body for 1,000 years. Rafando objects and threatens the Doctor. He tells him to check his Fatality Index. Rafando sees how impressive the Doctor’s fatality record is. He and his men decide to leave before the Doctor adds them to this list. The Doctor asks Nardole to help him put Missy’s body in the vault. ­­­­­­­­­­­­­­­­­­­­­­Two big things happened in this episode, we learned that Missy is in the vault and an alien race is running a simulation that will help them conquer our planet. We didn’t realize that most of the episode was in the shadow world until the end. I will try to make clear what the real world was, and what the simulation was. The flashbacks of Missy’s execution happened in the real world, after the Doctor had spent 24 years of domestic bliss with River Song in Darillium. The beginning of the episode, until the Doctor got the email was the real world. The rest of the episode was the shadow world until the shadow world Doctor sent the email to the real Doctor. When the Doctor called Bill that was the real world again. If you’re developing a headache from the explanation, sorry. Steven Moffat wrote the episode, sometimes his scripts can be a little too clever for their own good, but in this case the cleverness of the premise didn’t override good story telling. This was a well-told, well-acted story. It really all adds up once you get to the end. It really sets up the conflict between the Doctor and this invading alien race.